Dental Curing Light for the Polymerization of all Dental Material to include but not limited to restorative composite materials, bonding and sealing materials, and bleaching/whitening materials. Curing unit with high capacity lithium-ion rechargeable battery. A/C Charging unit with charging cradle. Fiber-optic wide band curing tip. LED Power: 10 W new generation high power LED. Curing cycles of: 3, 6, and 9 seconds. Power Source: High power cell techology by Sony. 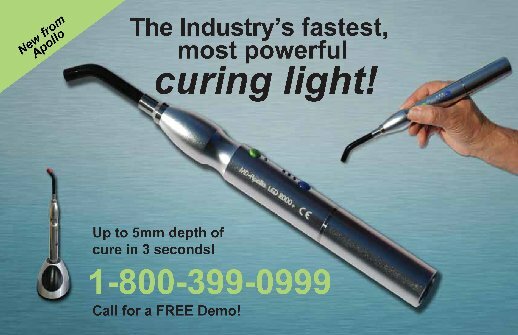 In a standard dental office, you can expect a minimum of 750 3 second cycles on a single charge with light intensity to cure any dental composite on market today in the 400-500nm range.